Winter Bike Commuting: See and be seen! It’s that time of year where visibility is poor. The days are shorter and darker. Research of Portland bike commuters revealed that traumatic injury rates while bike commuting double during the months of December and January compared to the rest of the year. (1) Take care to ride safe and maximize your visibility to see and be seen. A steady beam tail light and reflective clothing can make you more visible to drivers at night. If riding in the dark, wear light or neon colored reflective clothing with adequate lighting to maximize your visibility. It’s not only smart, it’s the law! Did you know that Washington state law (RCW 46.61.780) states that cyclists are required to ride with at least a front light and an approved rear red reflector on the back in the dark? A red light visible from five hundred feet is also recommended in addition to the red reflector in this law. A powerful headlight increases your ability to see the road surface and signs, avoid dangers, and make you more visible to oncoming traffic. While blinky lights are a great way to get attention, make sure you have an adequate steady light beam from your main front light to optimize your own visibility of the trail and road as you ride. A rear steady red light is also highly recommended. Using a steady beam light is commonly advised over a blinky light as it will provide consistent visibility for motorists to see and judge their distance relative to you. Another perspective is that flashing lights are usually reserved for emergency vehicles. Using a steady light clarifies that you are a cyclist and not a new form of emergency response. How much light is enough? It depends on where you ride (bike trail, city, unlit rural road, off-road trail, etc.) and how fast you ride. The general minimum recommendation is at least 100 lumens. A lumen is the measure of light output. The greater the lumen number, the brighter the light output. 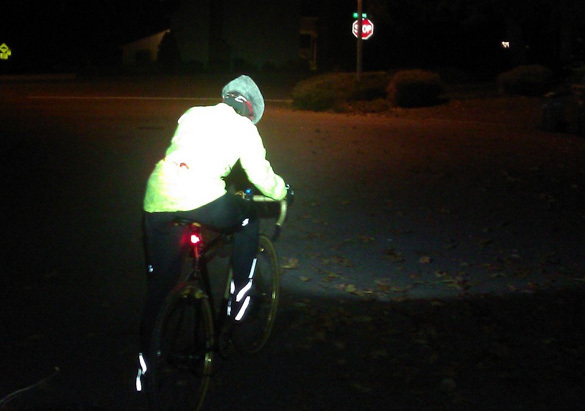 If you ride slower than 12mph on a paved surface, 150 lumens may be adequate. 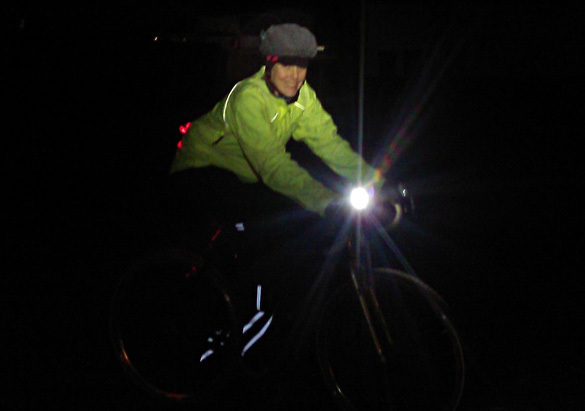 500-750 lumens are suggested if you ride up to 20mph and 750 lumens are best if the riding speed is faster than 20mph. A wide light beam pattern will maximize your personal visibility as it illuminates the obstacle you want to avoid as well as the greater area and sides around the object so that you can safely ride around it. Seeing potholes, bumps, gravel and other obstacles well ahead of time will help ensure your commute is not interrupted by a trip to the emergency room. Other environmental bike commute hazards include the leaves and branches that are now on the ground instead of on trees. Wet leaves on pavement are dangerous because they are slippery and distort depth perception to the surface underneath. Branches are an unpredictable risk if you choose to ride over them as they are never uniform in shape, contour and size. Wet moss is another northwest hazard that can be deceptive, hard to see, and especially slick on corners. As it gets colder, knowing the surface and ground temperatures is wise to better determine whether the bike light is reflecting water or ice on the pavement. Frost and ice can also form quickly on bridges and overpasses as the cold wind is able to chill the surface from above and below. In the Portland bike commute study referenced earlier, poor roadway surface conditions were a factor in about 20% of traumatic and serious traumatic events. Almost half of all traumatic events (48%) and serious traumatic events (56%) involved a motorized vehicle. Most of these events occurred on bike lanes/wide shoulders and residential streets.1 Bottom line, SEE: maximize your personal visibility through adequate lighting and appropriate environment riding caution AND BE SEEN: wear reflective, neon or white clothing with enough lights that you are mistaken for a riding Christmas tree. Resources: Check out Bike Radar’s great bike light comparison tool which shows models, beam depth and shape, and prices. Reference: Hoffman MR, Lambert WE, Peck EG, Mayberry JC. Bicycle commuter injury prevention: It is time to focus on the environment. Journal of Trauma and Acute Care Surgery,69(5); 1112-1119.